Jen Hollywood-Showell is the incredibly talented designer behind J Hollywood Designs, and she creates some truly stunning pieces featuring the brilliance of moissanite. Below, she tells her favorite moissanite story, and shares some great photos and videos of moissanite in different kinds of lighting. 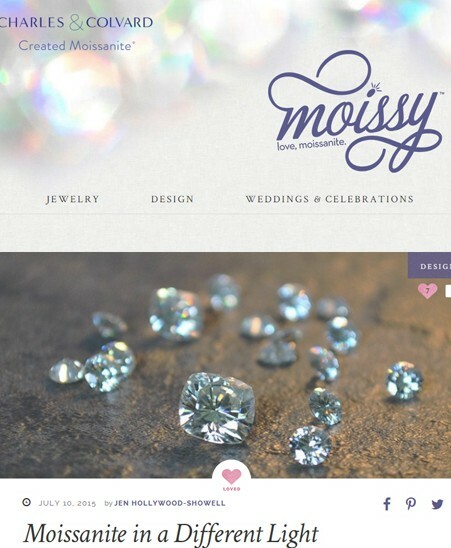 I’ve been making and selling moissanite jewelry for a few years now, and everywhere I go, people remark on my engagement ring and wedding band, or on my moissanite stud earrings. After they gaze wide-eyed at them for a moment, only then do I tell them what it is – an eco-friendly gem that is more brilliant than a diamond, almost as hard, and only 1/10th the price. Jaws drop every time. My favorite moissanite story is from when I was in Cancun earlier this year. I was hanging out in the pool, perhaps with a Corona in hand. A guy came over and complimented me on my ring. I said thanks and swam over to show it to him and his wife. He checked it out and was very impressed with the stone; his wife loved it too. Turns out they were diamond buyers from Chicago! I told him it was Forever Brilliant® moissanite, and he couldn’t believe it. He looked at it again, and so did she, and they still couldn’t believe it. We ended up chatting for a while, and the whole time he kept glancing at my ring and shaking his head, mumbling he couldn’t believe it wasn’t a diamond.